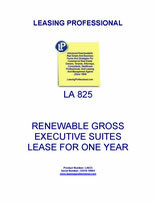 This form is for a short term executive suites lease. The term is for one year and is renewable, and the lease is a gross lease. The details of the tenant's ability to use the reception area and conference rooms, receive telephone and voice mail and secretarial services are contained in the form. This lease is made and entered into ______________ and between GARDEN VARIETY EXECUTIVE SUITES, a ____________ corporation (herein after referred to as "Landlord"), and ___________________ EXECUTIVE SUITES TENANT, a _____________ corporation (herein after referred to as "Tenant"). 1. DESCRIPTION OF PREMISES. The premises consist of Suite ___________ at Garden Variety Executive Suites. The premises are outlined on the attached floor plan as Exhibit A. In addition, Tenant shall have use of the common areas including the lobby and conference rooms to be shared with all other tenants. The Garden Variety Executive Suites building is a non-smoking building. Smoking is permitted outside in the atrium areas. 2. TERM. The term of this Lease is twelve (12) Months, commencing ________ and terminating _____________ unless terminated sooner as herein provided. 3. RENEWAL. Tenant agrees that it shall give Landlord thirty (30) days written notice, return receipt requested, of Tenant's intention to vacate this premises at the expiration of the aforementioned term. In the event Landlord does not receive such notice prior to thirty (30) days as provided herein, Lease shall be renewed for an additional period equal to the original term subject to the same covenants and conditions as contained herein. In addition to the right of Landlord to terminate this Lease Agreement as otherwise provided herein, Landlord shall also have the right, irrespective of Tenant's rights, to terminate this Lease Agreement at the end of the original term or any renewal term as provided herein by giving written notice of such intention to terminate Lease, return receipt requested, at least thirty (30) days prior to the ending date of the original term or any renewal term as provided herein. 4. USE. Tenant shall use the premises for the following specific purpose of general office business, and shall not use or permit the premises to be used for any other purpose without prior written consent of Landlord. For so long as Tenant shall comply with the provisions, conditions and covenants of this Lease, Landlord also warrants and guarantees that Tenant shall have full enjoyment and peaceable possession of the Premises for the use stated herein without hindrance or interruption at all times during the term of this lease. 5. RENT. Tenant agrees to pay to Landlord, without prior notice or demand, for the premises, the sum of ___________on or before the first (1st) day of each and every successive calendar month thereafter during the term hereof, except that the first month's rent shall be paid upon the execution hereof. Rent for any period during the term hereof which is for less that one (1) month shall be prorated portion of the monthly installment herein based upon a thirty (30) day month. Such rent shall be paid directly to Landlord without deduction or offset, in lawful money of the United States of America. If the rent is not received by the Landlord within ten (10) days from when the rent is due and payable as provided herein, Tenant shall pay to Landlord, a late fee in the amount of twenty-five dollars ($25.00) payable immediately thereafter. The late fee is payable without prejudice to Landlord to exercise any other rights or remedies if Tenant fails to pay his rent. In the event rental is not paid in a timely fashion, Landlord may deny use of common areas until payment is made pursuant to this lease. This is a gross lease. The Landlord pays for utilities including gas, electrical and water. The Tenant pays for his/her own telephone bill. Landlord shall provide building standard janitorial services five times per week (except for national holidays). Upon execution of Lease, Tenant shall pay to Landlord _________ representing the rent for the first and last months. If the specified term of this Lease is for more than (1) year, rent for the second year and each succeeding year of this Lease shall be increased by five percent (5%) for each such year. 6. SECURITY DEPOSIT. An additional deposit of _______ for any expenses caused by Tenant, including but not limited to damages, cleaning, painting and unpaid rent or other fees, shall be deposited with Landlord upon execution of Lease. Total monies due upon execution of Lease (security deposit plus advance rent) are _______ , plus any pro-rata due for a partial month. The Security Deposit is fully refundable, if no expenses are incurred by the Landlord. Landlord shall be held responsible for damages it causes and Landlord shall leave the premises in similar condition as they are at lease inspection, less ordinary wear and tear, repairs and/or cleanup from casualty. 7. a) RECEPTION AREA AND RECEPTIONIST. A furnished Common area shall be provided for the purpose of receiving clients, customers, and guests of Tenant who are awaiting appointments or meetings with Tenant, Landlord shall provide a receptionist in such area from 8:30 a.m. to 5:00 p.m., Mondays through Fridays, Holidays excluded, for the purpose of greeting such clients, customers and guests and to promptly inform Tenant or its agents of their presence. b) ANSWERING SERVICE AND VOICE MAIL. Landlord shall provide one person to answer, incoming telephone calls of Tenant during, office hours as stated above in subparagraph (a) and to promptly forward messages to the Tenant, its agents, or voice mail box. Tenant will pay for all fees necessary for the installation of telephone communications in Landlord's Suite for the purpose of receiving outside calls. It is necessary to have a telephone that is compatible with Landlord's telephone system. The telephone service provider will bill each tenant for their lines installed and bill each tenant for their monthly phone charges. c) SECRETARIAL SERVICE. The Garden Variety Executive Suites will ensure that a secretarial support service is maintained on the premises. This service shall provide word processing, copying, and faxing for a fee, on a first come basis. Fees will be negotiated directly with the secretarial service. Each user of the secretarial service shall be solely liable for the accuracy of their communications and/or correspondence and shall hold Garden Variety Executive suites and the secretarial service harmless from any damages as a result of inaccuracy or errors. d) CONFERENCE ROOM. Landlord shall provide one or more conference rooms for the purpose of handling conferences or meetings staged by Tenant. Such conference room(s) will be available on a first-come, first-served basis through prior arrangement with the Landlord's receptionist or designated agent Landlord reserves the right, from time to time, to institute and/or change the rules and regulations relating to the use of the conference room(s). The rules and regulations established, from time to time, are hereto incorporated into this Lease and the breach of such rules and regulations shall be deemed a breach of this Lease.